Based on reviews from 24,321 users. 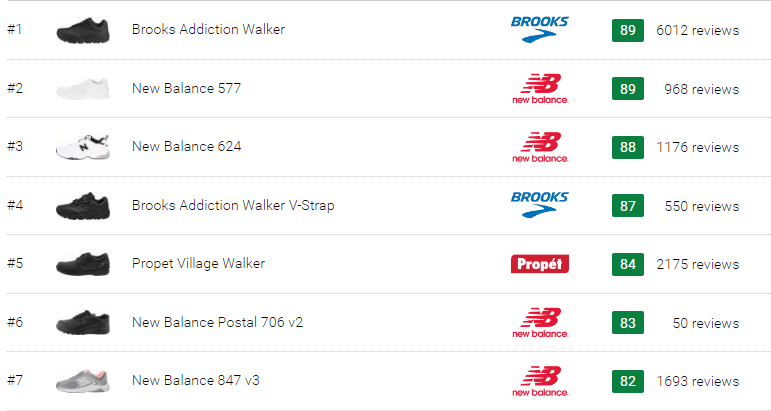 Learn how our rankings work or see our guide to narrow training shoes. Updated Apr 2019. Choosing the right pair of training shoes for your athletic endeavors can be a challenging task even if you have regular-sized feet. But it gets even more complicated for people whose feet are slimmer than the industry’s standard width. It can be pretty frustrating to try a pair after pair one store after another only to find that the best-looking and most comfortable shoes are too loose on you. If you happen to recognize yourself in this description, we would be glad to keep you company and do our best to help you get that perfect-fitting trainer for the job. Narrow training shoes: what are they? One of the key parameters that people consider when shopping for shoes is size. However, not everybody is aware that size only indicates the length of the footwear, heel to toe, and is presented in numbers. The first thing that most people do when a shoe fits too big is to go a size down. And it does help when the trainer runs long. But when the length is right, and the shoe still feels loose and not supportive enough in the upper, it is a clear sign that you need a narrower width rather than a smaller size. Brands may use different letters or names to represent their shoe widths. But most of them have a very similar categorization (see the table below). Narrow training shoes are the type of athletic footwear which comes in slimmer profiles than the standard/medium width. In this article, we are using the term “Narrow training shoes” in reference to the trainers in both Narrow and Extra Narrow width profiles. Unfortunately, not all major brands focus on doubling their shoe models in narrower or wider widths. That’s why the market is dominated by the footwear in Medium profiles, forcing many people to go with ill-fitting shoes, having no better option. the muscles of the foot will be trying to compensate for the wrong fit, leading to malformations and muscular imbalance. Besides, you are sure to perform your best when the shoes are not causing you any hindrances. They must work FOR you and not the other way around. See it as a long-term investment which will not only save you money but will also keep your feet healthy and happy. Even though the choice of narrow trainers is significantly smaller than that of medium or wide training shoes, it is not a mission impossible to get a pair. We have prepared a step-by-step guide to help you make an informed choice. The record shows that a considerable number of people have not had their feet measured since they were children. It is a common practice to merely rely on the way a shoe feels to determine your size. However, having the precise measurements of your feet’s length and width can help you a lot, especially when ordering shoes online. Note! Both methods of measuring should be performed at the end of the day or after exercise when your feet have reached their maximum volume. Also, be sure to wear the same socks that you are planning to match with your future training shoes. It is also the most accurate one as it is done with the help of a special Brannock device. It is designed to measure both foot length and width. Try asking your local shoe stores if they offer this service or purchase a device of your own. The instructions for using it come with the product. While this one may not be as precise, it still gives you the accurate numbers if done correctly. Place a piece of paper on the floor and put your right foot on it. 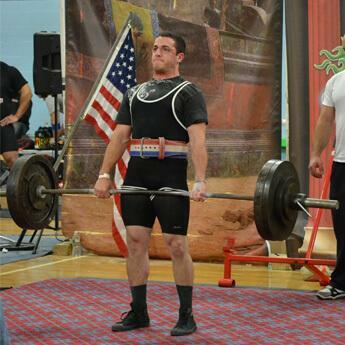 Make sure that you are standing straight and the weight is distributed naturally. Ask a friend to trace your foot with a pen/marker as carefully as possible, then do the same for the other foot. Use a ruler to measure the distance from the most prominent part of the heel to the longest toe. Then measure the widest part of your foot, which is usually in the ball of the foot. Do it for both feet and write down the measurements. There is a chance that one foot will be longer/wider than the other - it’s natural. Use the measurements of the larger foot for Step 2. Once you’ve got the numbers, search for the size and width charts provided by the major athletic brands or websites that sell footwear. You can also use our chart provided below to get the genera idea. Note! This chart does not give a 100% accurate answer to what your size and width are because different brands in different parts of the world tend to have their own standards. These charts provide information according to the North American measuring system, and the numbers are given in inches. They are only meant to help you gauge whether you need to consider a Narrow width. Now it’s time to focus more specifically on the kind of physical activity which you’ll be putting your training shoes through. Unfortunately, none of the brands is offering dedicated shoes for CrossFit or weightlifting in Narrow or Extra Narrow width profiles. They all come in a standard D - Medium width for men and in a B - Medium for women. However, you can still find versatile narrow workout shoes available on the market. These trainers are equipped with the materials and technologies which accommodate a wide array of athletic activities. They can be sported for gym sessions, HIIT workouts, walking, and even not too heavy weight training. 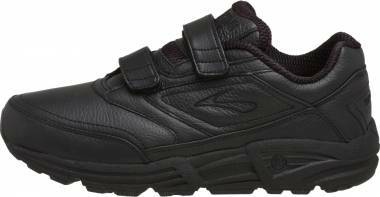 And if you want a supportive companion for extended periods of fitness walking, you can always go with specialized walking shoes which are available in narrow widths. Here at RunRepeat.com, we provide you with an aggregation of shoes from various brands. Be sure to select “Narrow” in the “Width” filter to check out men’s and women’s narrow training shoes available on the market at the moment. Make sure you’ve applied other key filters like “Gender,” “Size,” and “Use” to limit your choice to a few pairs. Then make use of the “Compare” feature in the Grid View to see the characteristics of the shoes side-by-side. Now that you have one or several pairs on your mind, make sure to check if they are currently offered at a discount. When the “Gender” and “Size” filters are applied, you will see the reduced prices in red, next to the original price. At RunRepeat.com we scour through 200+ online shoe retailers to provide you with the best deals available. Hopefully, your perfect pair of training shoes will be on the list! Check if the online retailer has a free return policy so that you could order several pairs in different widths. You will be able to try them on in the comfort of your living room and send back the ones that don’t fit at zero cost. Just make sure to read the conditions of the return policy carefully first. It is recommended to try on the footwear at the end of the day so that it fits your feet at their widest state. Also, wear the same socks which you’re planning to use with that pair of shoes. If you are prescribed an orthotic insert, put it inside during the fitting process as well. If you used to wear Narrow training shoes in the past, there is a chance that you may need to turn to the Medium width because our feet keep growing and changing over time. That’s why it is important to measure your feet before purchasing new footwear. Due to size and width discrepancies among the brands, there is a chance that you will need a Narrow width in one brand but a Medium profile in another. How do I know if I’ve got the right shoe width? Your widest part of the foot, which is in the ball area, should perfectly align with the widest part of the footwear. The shoe should feel snug even before you cinch the laces. Besides, the shoelace panels should not overlap when the laces are tied, unless it is designed with a burrito tongue. The rearfoot must be firmly braced by the heel section of the trainer. The foot should not wobble during side-to-side movements and the heel should not slip out of the collar. While the fit must be snug in the heel and the midfoot, there should be ample space in the toe box for the toes to splay unrestrictedly. There should be no pinching, squeezing, or other unpleasant sensations when you put the shoe on. If the material creases or bunches up, it’s a surefire sign that the fit is too loose. The trainer must feel comfortable immediately. While there is such a thing as a break-in period, it makes a very minimal difference. Don’t buy a shoe that’s too tight from the start. Take your time to really feel the trainer yourself. You know how it fits better than your friend or a salesperson. Make sure to stand up, walk around, and mimic a few workout movements in the footwear. It may take some time before you find a perfectly-fitting pair. So, arming yourself with patience will serve you the good turn and your feet will thank you in the long run. Should I go a size down if a shoe fits large? Firstly, you need to answer the question: is the shoe big lengthwise or widthwise? 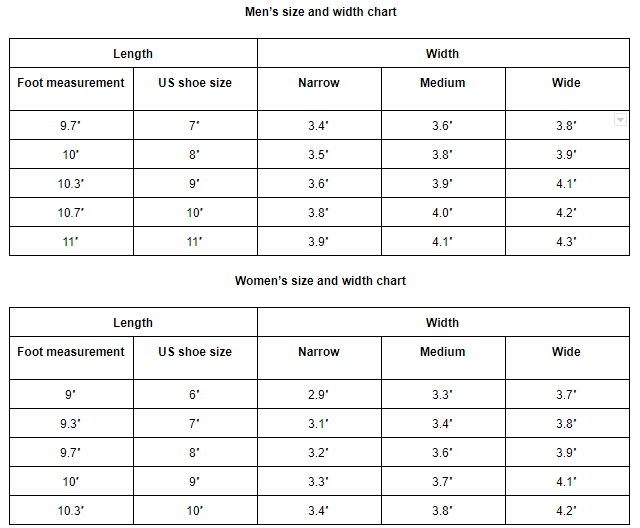 Sizes (shown in numbers) deal with the length of the foot, from heel to toe. So, if the trainer is long, then going down half-a-size or a full size will help. However, if the length is right, but the fit is still loose even with the laces cinched tightly, check if this model comes in a narrower width profile or try another shoe. What should I do if Narrow training shoes are too tight for me but Medium ones are a bit loose? insert an orthopedic insole to reduce the extra space inside the shoe.